Every year churches in England spend around £78 million on development and building maintenance. This encompasses significant adaptation to broaden the church’s range of activities, and it includes repairs and conservation to keep the building wind and watertight and in good decorative order. A further £29 million is spent on new buildings. This total of £107 million spent is a useful proportion of the £175 million understood to be needed each year for works to church buildings, but is clearly not all of it. When the Listed Places of Worship Roof Repair Fund was launched in 2014, the speed with which applications flooded in showed just how welcome this additional funding was, especially as it was relatively easy to access. The additional £25 million that will be offered in 2016 will also be in high demand. In addition to the support generously given by local communities to keep their parish churches functioning, significant support is made available through the Heritage Lottery Fund (HLF) with £30 million available per year for essential work to places of worship in the UK. Churches can also apply to other HLF schemes, the Big Lottery or other distributors relevant to the project. Central government provides financial assistance through the national statutory conservation bodies and through a few UK-wide schemes. (The national statutory conservation body for England is now called Historic England, and English Heritage has become a separate charity responsible for properties in care. In Scotland, Historic Scotland is being merged with RCAHMS to become Historic Environment Scotland.) This article will focus on two national schemes for supporting listed places of worship, both of which have been affected by recent changes. The LPOW Roof Repair Fund grant-aids basic but necessary fabric repairs to roofs and rainwater disposal systems. It is administered by the National Heritage Memorial Fund (NHMF) on behalf of the Treasury. It was set up in December 2014 with an initial £15 million set aside by the government to address water ingress as a major reason for decay of church buildings and a potential threat to keeping them open. The Roof Repair Fund was envisaged as a one-off scheme. Despite a short application period, approximately 1,900 applications were received. As a result, the chancellor extended the fund by £40 million in the 2015 budget. This enabled the amount allocated for the initial round to be doubled to £30 million, with £25 million set aside for allocation in 2016. The second round is expected to open in autumn 2015. It will be open to both new applicants and to previously unsuccessful applicants, who will be required to resubmit. Unsuccessful applicants will be able to request feedback to help them decide whether to reapply and how to improve their application. The NHMF is also undertaking a rigorous review, incorporating feedback received, to inform a revised application form and improved guidance. Recently appointed regional officers will be attending events over the coming months and aiming to provide more dedicated support for the second round. Concerns over the short application period for the initial scheme have been noted; fortunately, the Treasury has given a broader timeframe for allocating the second round, so the intention is for the application period to be extended. Eligibility requirements will remain unchanged. The building must be statutorily listed and used for public worship at least six times a year, but may be of any faith or denomination. An up-to-date condition survey (such as a quinquennial inspection report) must identify repairs to the roof or rainwater disposal system as urgent within five years. Churches that have a live fabric repair grant from a statutory or lottery source (such as HLF) are not eligible, but those that have funding from charities such as the National Churches Trust or a local group may apply. Churches that have received statutory funding for works that are now complete may be eligible but will be lower priority. Grants of £10,000-100,000 will be available and may cover the full cost of the necessary repairs, excluding VAT (which should be recovered via LPOW grants). Applicants can contribute their own funds, either if their total project cost exceeds £100,000 or if they wish to minimise their grant request. Although urgency is the principal requirement, applications must be shown to be viable so it will be necessary to enlist an architect or surveyor to prepare an outline specification and cost estimate. Applicants must be realistic in presenting their costs, including contingency, so that the assessor is assured that the project can be delivered within the scope of the grant amount. Successful applicants will need to be able to undertake their work within a two-year period from receiving permission to start, so a programme of works and cashflow are also necessary; the revised guidance will provide examples. Further information will be available on the LPOW Roof Repair Fund website. VAT at the standard rate applies to many works to buildings, with some items rated at zero or 5 per cent for disabled access and energy-saving products. The Listed Places of Worship Grant Scheme allows the cost of VAT incurred on works to listed places of worship to be reclaimed. Initially this was to give a level playing field when restoration attracted VAT and new build did not. When, in 2012, changes in the VAT rules resulted in nearly all works incurring VAT, the scheme was generously extended to include nearly all works to the building and fixed furnishings. The two basic criteria for the payment of a grant for eligible works are that the building must be listed and a VAT invoice must be presented to support the claim. VAT on relevant professional fees can also be reclaimed. Although there is a minimum claim, invoices can be batched to make this value, enabling pretty much all eligible expenditure to benefit from the scheme. UK places of worship claimed £18 million in 2014. This suggests that not all the VAT incurred on eligible works is being reclaimed. It is always worth checking if work is eligible for the scheme – the FAQs on the LPW Scheme website set this out clearly and there is a telephone helpline. Generous local giving continues to show the commitment of many people to the church, but significant support in grant aid is necessary to help the Church of England manage its 16,000 buildings, over 12,000 of which are listed, with around 8,000 listed Grade I or II*. ChurchCare, which is run by the Cathedral and Church Buildings Division of the Church of England (CCB), provides a range of grants for parish churches. Generally, this is in partnership with grant-giving bodies which support the investigation and conservation of the historic contents, sculpture and furnishings in Church of England churches. Some of the funding programmes are supported by The Wolfson Foundation, The Pilgrim Trust, The Radcliffe Trust, the Worshipful Company of Goldsmiths, and the Gunnis Fund. ChurchCare has over £0.5 million in funds to award every year and receives a huge number of enquiries and applications. With the help of other charitable bodies, foundations and trusts, ChurchCare awarded over £1.1 million in 2013 through 199 grants to projects in cathedrals and churches. ChurchCare provides funding for the conservation of bells, books and manuscripts, clocks, church plate, churchyard structures, fabric repairs, metalwork, monuments, organs, paintings and wall paintings, stained glass, textiles, and timberwork. Applications are assessed by committees, whose members include a range of experts and specialists. It funds a wide range of projects, from small-scale repair of locally important objects, to contributing to large scale, nationally important projects involving conservation, public engagement and improved access. 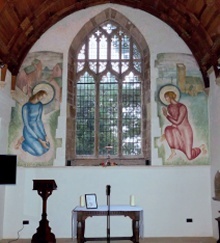 Projects such as the repair of the Evelyn Gibbs murals at St Martin’s in Bilborough (above right) combine funding from ChurchCare with grants from the HLF, EH, and the local historic churches trust to deliver projects with a range of outputs for heritage and people. 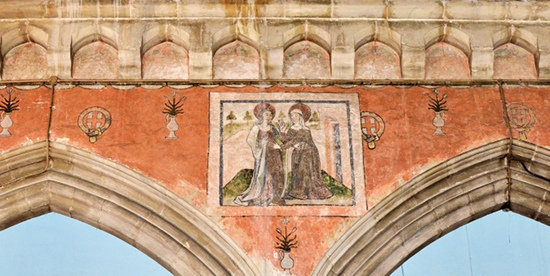 Initially, ChurchCare can support the investigative work required to understand an object or historic asset and to ensure that conservation proposals are appropriate. Conservation reports are an essential first step and ChurchCare provides detailed guidelines on their purpose and use. The CCB Division also works in partnership with the Wolfson Foundation Trustees to deliver a bi-annual programme of funding for urgent fabric repairs to Anglican churches listed Grade I or II* in the UK. Applications are assessed both on the need for the repair works and on the ability of the parish to contribute financially to the project. The division tries to fund a range of projects with a good geographic spread of funds across the countries and regions. It is keen to encourage more applications from northern England, as well as Scotland, Wales, and Northern Ireland. In many cases these grants, of up to £10,000, are requested as a partnership contribution towards a larger scheme funded through the HLF Grants for Places of Worship programme or the National Churches Trust Repair Grants programme. 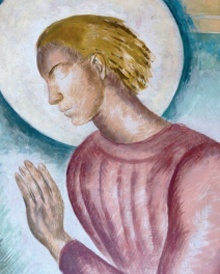 The ChurchCare website also provides a wealth of information on funding and best practice, including guidance documents and links to other sources of funding, and contact details for staff in the Church Building Division who can provide further support for projects and conservation proposals. For contact details of the principal church authorities see http://bc-url.com/churches. DAVID KNIGHT PhD is senior church buildings officer at ChurchCare. In this role he has oversight of the work of the Church Buildings Council and its relationship with the dioceses. He has previously been ChurchCare’s senior conservation officer. LISA McINTYRE BAGradDip is a church buildings officer for ChurchCare and the main point of contact at the Church of England for the LPOW Roof Repair Fund. She previously worked as a heritage consultant in the commercial sector. EMILY GREENAWAY is the grants officer for ChurchCare, where she is responsible for the effective operation of the grants programme. She was previously a grants officer with the HLF.